Towables come in all shapes and sizes; from couples campers all the way up luxury 5th wheels with all the bells and whistles, picking the right towable is a big decision that demands a level of knowledge that some new RVers just don’t have yet. Fortunately, we’ve been through the ringer a time or two, so we know a lot about the pros and cons of all types of towables. When it comes right down to it, the two major types of towables are the fifth wheel and the travel trailer. So, if it is a towable you are shopping for, chances are you will be getting one of these types. There are some big differences between travel trailers and fifth wheels, and we are here to solve the great debate. There are a lot of questions to answer here, so we will start with some of the basics. The 5th wheel is a specialized towable RV that is constructed with a section in the front that is designed to be raised above the bed of your truck and is hitched with a special fifth wheel coupling so that it is connected vertically, rather than the horizontal coupling of a regular travel trailer. This particular style of towable can only be towed by a pickup truck that has been outfitted with the special hitch coupling. What Makes a Fifth Wheel Awesome? The fifth wheel is special in that it is designed with a more luxurious standard of living in mind. Often equipped with all the comforts of home, a 5th wheel optimizes every inch of floorspace and wastes nothing when it comes to overhead storage or extra seating. Fifth wheels also have some features that you just won’t find in a travel trailer, often due to a want of space. With a 5th wheel, you get style and comfort along with the floorspace necessary to really allow you to not feel cramped when on the road. There are also some fifth wheels that are convertible toy haulers, allowing you excellent garage space, but that can convert back into sleeping quarters when needed. How is a Fifth Wheel Different from a Travel Trailer? Comes with larger, roomier floorplans that optimize every nook and cranny to make sure that no space is wasted. Can be used for full-time RVing, for those who love year-long adventure. Allows for greater maneuverability when you are on the road — jackknifing, for instance, is rarely a concern. Makes backing into that perfect camping spot is a breeze. Has much more storage space both inside and outside. Is much more likely to have king-sized floorplans for truly luxurious living conditions. Is usually taller, allowing for you to stand up straight without feeling like you need to hunch over. Is very easy to hitch when you are ready to hit the road. Is heavier, making it harder to tow and harder on the gas mileage. Are usually longer, making it harder to find a place to set up. Are more expensive, on average. Typically have more slides and moving parts, which means there is a good deal more maintenance required. The travel trailer is often used as a generic term for any towable RV that you can bring along with your truck. However, the term “travel trailer,” should more accurately be confined to any towable that is hitched to the back of a vehicle and towed with conventional travel trailer hitch. The travel trailer comes in so many different shapes, styles, sizes, and layouts, that it is impossible to cover everything that a travel trailer may entail. For instance, there are some travel trailers that are optimized for only two people. Other travel trailers pack small, but then expand to be able to sleep upwards of a dozen people. There are some still that are massive luxury travel trailers that come with multiple entrances and bathrooms, and even some that come with awesome outdoor kitchens. What Makes a Travel Trailer Awesome? The travel trailer is often very light, meaning that it can be towed by a much wider array of vehicles than just your typical 4×4 pickup. The most alluring aspect of a travel trailer is that it comes in so many different styles and floorplans, from simple, self-contained to massively multiple slideouts. If you are looking for a camper that just fits you and perhaps one or two others, there are plenty of travel trailer options, like a pop-up or an expandable. If you are looking for a full-family camper that is complete with fireplace and a kitchen to rival your home kitchen, you might be looking for a luxury liner. Or, if you want to bring your favorite gear along with you, but still have enough space for the family to be comfortable at night, a toy hauler travel trailer might be the right choice. There are so many possibilities, you won’t know where to start! 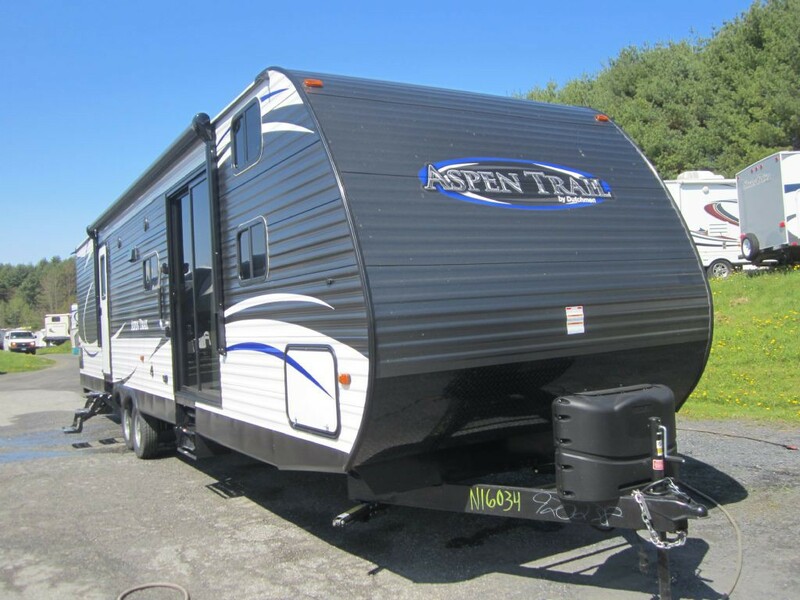 How is a Travel Trailer Different from a Fifth Wheel? Is a lot more affordable, on average, than a fifth wheel. Is able to tow without necessarily needing a truck. Makes boondocking a lot easier, as the RV can be fit into a wider variety of settings. Is often more compact, allowing for greater accessibility on the road and in RV parks. Enables the use of a truck bed, if a truck is still being used to tow. Is often lighter than a fifth wheel, meaning that a much wider variety of vehicles can tow it. Is longer and, with the traditional travel trailer coupling, will not be as stable, making it prone to swaying more. Has lower ceilings, making it feel tighten when RVing long-term. Is, on average, smaller than most other RVs. Who Might Prefer a Fifth Wheel? The fifth wheels is perfect for someone who has a large truck and loves luxury when on the road. If you love going camping, but never like feeling cramped in a tent or smaller camper, the fifth wheel might just provide you with the level of comfort that you’ve been missing. The 5th wheel makes for a higher level of maneuverability on the road, so if you do not like being rigid when driving on the highway, you might prefer the fifth wheel. Or, if you just don’t want to have to worry as much about tight curves or quick U-turns, the fifth wheel alleviates much of that. If you are looking for comfort over convention, this is the towable for you. 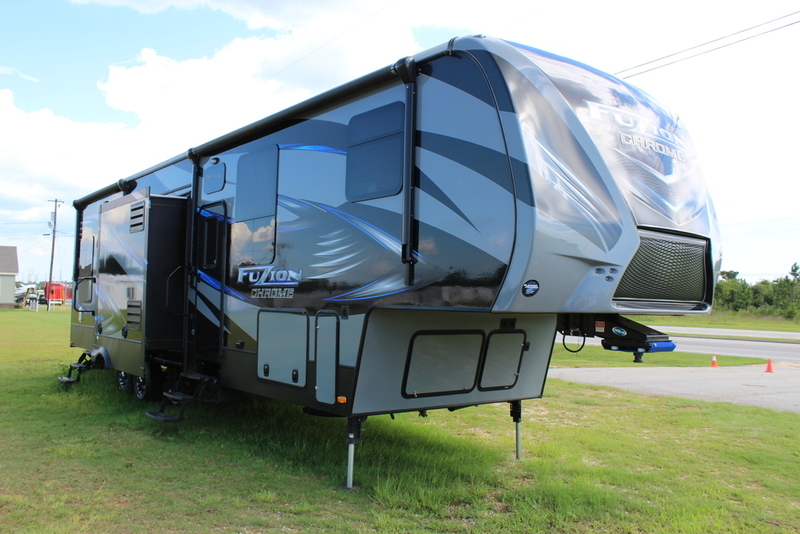 Many 5th wheel models come with a variety of functions and features that you just won’t find in smaller RVs. Who Might Prefer a Travel Trailer? 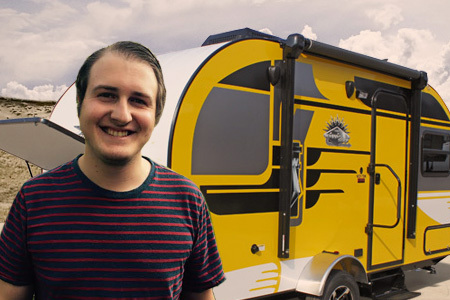 The travel trailer is for someone who does not want to have a dedicated vehicle just for towing an RV. It is for someone who is more practical about their camping aspirations and is willing to mix a little bit of “roughing-it” in with the RVing life. 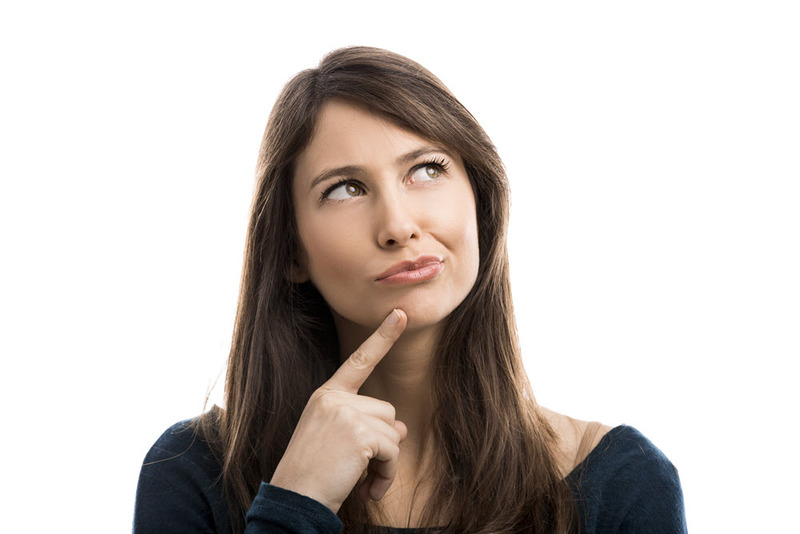 When it comes to making that final decision on which is the type for you, all you have to do is answer a few questions; namely, what features are the most important to you as a potential RVer and, what is your price range? Also, what kind of RV can your current vehicle tow? This is a question that is often overlooked, so check out our tow guides to get started by looking at our catalogue of RVs that separates these awesome models by weight in the filter to the left. It may take a good bit of thought and just as much research to really determine which features and styles are best suited to you. You might think you are a travel trailer person, but then find that the fifth wheel is more your speed. When it comes down to it, there is no wrong way to go RVing. In fact, you are likely to be able to find something to love no matter if you have a two-person pop-up or a 45ft 5th wheel; but remember, a little homework can go a long way in finding your ideal make and model! 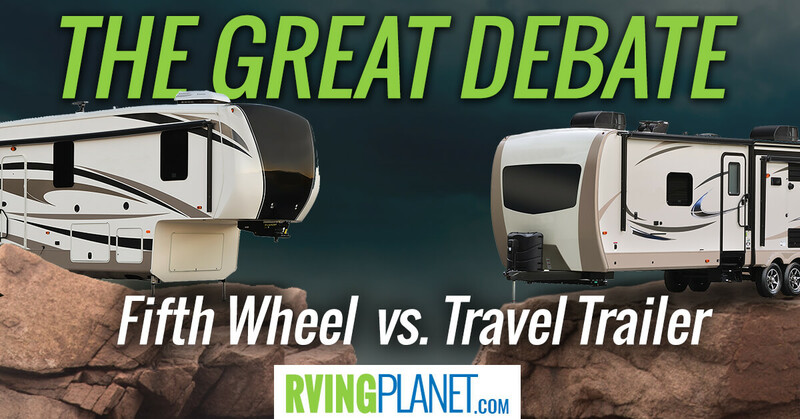 Both of these towable RVs have their upsides and no two RVers are going to want the same features. What is most important is that you love your RV and the awesome stuff that comes with it. What do you look for in the perfect towable? Answer in the comments section.